The REALM program currently supports 14 projects spanning a wide array of research contexts and methodologies, interlinked by a common administrative and data core housed at INCITE. These projects are already contributing valuable insights into the dynamics of labor migration, including migration decisions, recruitment and obligations, migrant well-being, and the immediate effects of migration on sending country communities. We capture novel information throughout the migration process: from the expectations, information, and preparations involved in the early stages to the later impacts of migration on migrant health and family planning. Some projects do so in areas with a long history of out-migration, while others explore areas that are new to the international migration stream. Some take as their focus the migrant themselves, while others focus on the families they leave behind. The projects described below are at various stages of the research process; some are in their final stages of analysis, while others are piloting new designs. This ethnographic project is designed to help generate hypotheses about the way in which migration to the Gulf affects gender hierarchies in Malappuram, Kerala. Families of labor migrants, especially migrants’ spouses who remain in the sending country, are generally conceptualized as “left behind” – often in situations that might not be conducive to their well-being, without the protection their absent husbands may afford them. The project seeks to answer following questions: What is the impact of global migration from Kerala on transnational families, and, particularly, the gendered identities of these women? Specifically, how do they shape the lived experience of women in Kerala who do not migrate themselves but are still significantly impacted by the process? How do these effects vary between religious and social groups? What are the possible effects of intergenerational migration experiences? While the project focuses on the outcomes for the women “left behind”, we believe that the research will provide valuable information about the motivation and decision making processes of Keralite migrants to the Gulf, in keeping with the sociological insight that families and kinship networks are involved in most migration events. This project will deploy an ethnographic toolkit to explore and compare two national segments of the labor brokerage component of the transnational migration system that shuttles labor migrants to the Arab States of the Arabian Peninsula. Utilizing a rapid ethnographic approach to build two brokerage assessments in migrant-dense sending regions of South Asia — the Peshawar Valley of Pakistan and the Terai Plain of Nepal — the investigators intend to describe, delineate, and compare portions of this migration system, and thereby begin to assemble a broader understanding of the structure and mechanics of this transnational system. This project adds a new migrant survey component to an existing, funded NIH Program Project, the Family Migration Context and Early Life Outcomes Project (FAMELO). FAMELO examines the impact of migration by family members on children age 5-17 who remain in the sending context and assesses their early socio-emotional adjustment, socialization, schooling, and transition to adulthood. The Nepal component of the FAMELO project in Chitwan, Nepal, interviews both the child and a primary caregiver in the sending context, but currently has no direct interview with migrants who have left the household. This proposal builds upon the Nepal FAMELO study design with a telephone survey of migrants who have left the focal children's homes. An aim of FAMELO is to understand how children transition to adulthood and may even become migrants themselves. Interviewing household members who have left as labor migrants allow us to understand how the migration experiences of currently migrating household members affect children's life courses. This methodologically innovative project focuses on the pathways that aspiring migrants take in order to engage with sending country recruitment agencies. These pathways comprise complex, informal networks of sub-agents working at the local and regional levels on behalf of larger, national-level recruitment agencies. Along these pathways, aspiring migrants acquire and develop expectations, plans, and a range of obligations from different sub-agents. However, it is unclear how much they understand about these expectations and commitments because of possible misinformation from sub-agents. The goal of this pilot project, situated in Pakistan, is to make a methodological contribution to the study of labor migration processes that is scalable and transferable across sending countries. The project combines in-depth interviews with aspiring migrants and their household members with the deployment of a mobile phone application to collect data at micro spatiotemporal intervals during their recruitment journey. This mixed method data collection technology can be used to study various highly mobile populations navigating the multiplex, opaque social landscape of labor migration over time. The study will augment a new and powerful data source for studying migrant and guest worker well-being, the Matlab Health and Socioeconomic Survey (MHSS). In 1996, MHSS1 collected rich data on a representative sample of 11,165 individuals living in Matlab, a high out-migration region of Bangladesh with a long history of population research. In 2012-2014, MATLAB undertook MHSS2, a followup of all surviving MHSS1 respondents, their descendants, and certain coresidents (32,825 respondents). Among prime-age male cohorts, more than 20% of males were living outside the country, with most in GCC states. MHSS2 surveyed more than 90% of targeted internal migrants and 82% of international migrant males, the latter of whom were interviewed both in person during return visits for Eid festivals or via phone survey. This project will use a unique longitudinal survey on a representative sample of guest workers, internal migrants and non-migrants from the Matlab region of Bangladesh to GCC countries and other labor-importing states. The design enables the investigators to go beyond simply evaluating the main effects of migration by collecting new data on migration finance, manpower recruitment and social networks that could help to explain the pathways to migration vulnerability and success. This project undertakes several novel strategies for examining the distribution of gains in the context of workers from Asia seeking work opportunities in the United Arab Emirates (UAE). In particular, the investigators focus on how the recruitment process for workers and the labor supply chain affects the distribution of gains across workers, firms and labor brokers (middlemen). The project collects data through two field experiments and an audit study. The first experiment studies a large number of workers screened by big UAE firms – some qualify but do not go to the UAE, others qualify and go to the UAE, and yet others do not qualify. By studying and surveying these three groups the project is are able to get insight into a wide range of questions including the impact of migration, the heterogeneity of recruitment fees paid by different people, the interaction with skills, information asymmetries and beliefs and perceptions on costs and benefits of migration. Building on a large recent literature that has found that direct cash grants are among the most effective development and anti-poverty programs, the investigators intend to pilot a second randomized experiment, crossed with the first over the same sample, to offer partial debt relief for the loans that pay the middlemen for a subset of workers. The different types of conditional and unconditional cash transfers we implement will provide invaluable information on the assertion that workers are bound to their jobs in part because of the huge debts they have to pay off. Finally, the project intends to conduct audit studies that will provide information on the recruitment process at a different stage of the migration process: when brokers are first contacting potential migrants, for example in their villages. This provides information on both the level of recruitment fees as well as social networks in the source and destination countries. This is a two-year, multi-sited augmentation project that builds on years of intense field work in three districts in Kerala to continue ethnographic study of migrants, with a special focus on identifying the positive elements of the migration experience over the typical representation of migration as drudgery, exploitation, et cetera. The idea is to build on the investigators’ previous work and to add to that corpus of research narratives of the migration experience that are thought to be critical in shaping migration decisions. The CDS is conducting two augmentation studies on representative samples of households in Kerala: the 2016 survey builds on a 2011 household survey that includes 14,000 households in 14 districts, while the 2018 survey builds on households surveys in 1998, 2003, 2008, and 2013 for 22,000 households. The PIs broadly examine migration decisions by household members, and the consequence thereof. Earlier research using this dataset sought to understand better the determinants of migration and the impact of migration on household incomes, studying remittance behavior, comparing migrants’ and families’ remittance expectations, knowledge of migrant’s salary, and management of household finances. In this round of the Kerala Migration Survey (KMS), the PIs have added a component on the impact of migration on women left-behind, allowing them to study whether husband’s migration has implications for women’s autonomy in everyday life and in household decision-making. They have also added a question on the migrant’s social networks, exploring how the information and migration decision making relates to the migrant’s social network of friends and acquaintances in the sending and receiving country. This augmentation project crucially allows us to analyze the effects of migration by tracing changes in household behavior before and after the migration event. This project studies norms transmission from the destination to origin country, looking specifically at fertility and contraceptive use among return migrants from Bahrain to the Philippines. The goal of the project is to inform orientation and reintegration programming for temporary contract firms. The project uses a difference in difference approach, exploiting variation in reproductive health policies of in the top 25 Philippines migration destinations to compare outcomes before and after reproductive laws were modified in host countries. It will create a new, rich data set on the historical density of migrants by province and destination to construct a measure of exposure to norms in host country. It will also validate Google trends data as a proxy for migration intensity using administrative data from the Philippines. This will allow the project to be extended to study norms transmission in sub-Saharan Africa, which is a new migrant sending region. REALM values the insight on norms transmission that this project would provide, and also the rich data sets it would construct—especially regarding the Google trends element, which could be methodologically groundbreaking. REALM invited Dr Theoharides to expand her range of dependent variables to capture gendered aspects of migration in addition to reproductive health seeking behaviors. This project is a small exploratory pilot study directed towards understanding the roles that brokers play in a small migration stream of individuals from two small islands - Hatiya and Sandwip - in Bangladesh moving to Oman to work as fishermen. The pilot is promising because the migration stream is characterized by frequent experiences of failure; yet individuals continue to migrate. Understanding in detail a very specific niche in the migration experience promises to shed new light on dynamics that may be present in other contexts, including environmental degradation or hazard as a push factor. Further, this generation of migrants is the first of this migration niche, providing an opportunity for the PI to track the evolution of the niche from its very beginning. This pilot project is designed to study the involvement of informal sub-agents in the recruitment process of labor migration in Sri Lanka. Sub-agentsfdad are informal representatives of licensed agents, who mediate between potential migrants and licensed agents, and help migrants navigate the migration process. Sub-agents are important stakeholders in the recruitment process of female domestic workers from Sri Lanka to the Gulf Cooperation Council countries (GCC). The study is limited to female domestic workers heading to the GCC. The immediate objective of the project is to assess the causal effect of the recent policy to rescind the recognition of sub-agents in Sri Lanka. The long term objective of the proposed study is to pave the path for evidence based policy formulation in regulating the involvement of sub-agents. The study collects information from migrants and licensed agents – the two groups who receive the services of sub-agents. The proposed research adopts an innovative approach to building data structures of migrants before and after migration by adopting a cohorts perspective of migrants instead of individual migrants. The project involves two survey waves of rolling samples of current and potential migrant household in three purposively selected districts in Sri Lanka. Survey data are complemented by Key Informant Interviews with regulators and licensed recruitment agents. The study will make an important contribution to recruitment literature in Sri Lanka by focusing on the rarely focused yet hidden, powerful and important players in the migration process. This project builds on research on low-wage migrants’ health by elucidating the politics of migrant workers’ access to healthcare, particularly in how the structure and process of healthcare entitlement is mediated by transnational labour brokerage networks with resulting health inequities being created. It will expand the focus of emerging scholarship on domestic workers’ health rights in the GCC and policy analysis of state processes concerning migrant healthcare by examining how migrant workers’ healthcare protection, financing and governance is distributed transnationally. The project will be an interdisciplinary, mixed qualitative study that will be conducted in Sri Lanka and Kuwait. 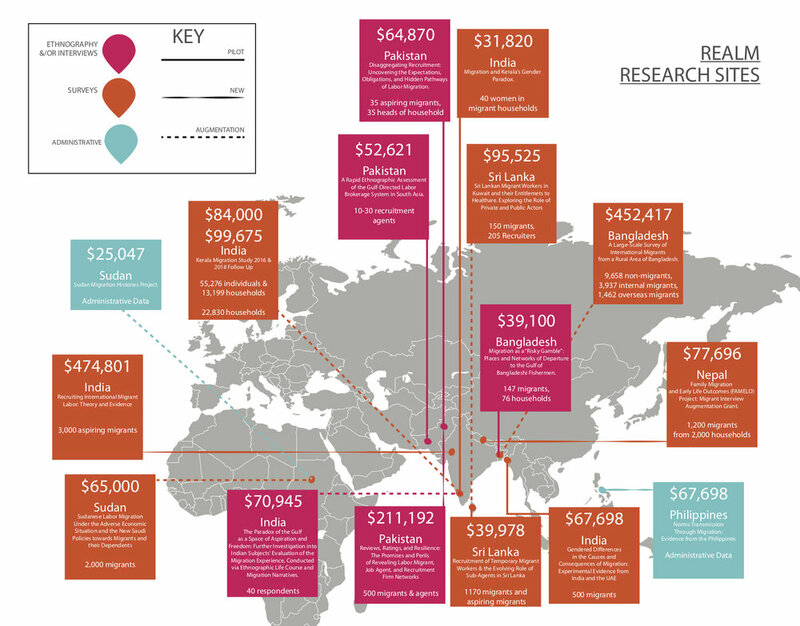 The PI builds on extensive prior research on migration and women’s health in Sri Lanka, and aims to recast understandings of the ethics of migrant labor recruitment by highlighting the intersections between health systems and migrant labour recruitment systems that span Sri Lanka and the Arab Gulf. This project builds on the methodological innovations and substantive findings of the REALM-funded pilot project by PI Karell conducted in the first round of funding. It aims to understand the intended and unintended consequences of providing information to migrants and agents in the labor recruitment context. Specifically, how does an information shock affect a market of clientelistic relationships. The PIs utilize novel foundational data about how migrants and their family members view agents, and deploy a mobile phone questionnaire application to to uncover the structure of the migrant-agent-recruiter network; measure agents’ pricing structures; implement a novel survey experiment while measuring network change; and explore a method for delivering information to migrants and agents. The project is conducted with migrants and agents in Pakistan, using both interviews and the phone application. The project’s findings will contribute to the scholarship on labor migration by identifying the relationships between agents and migrants and agents and recruitment firms, as well as how these relationships work. It will also offer direct insight into how REALM can help reform migration practices by indicating how to develop and deploy a tool to identify, review, and rate actors in the migrant-agent-recruiter network—and then share this information while mitigating negative unintended consequences. The final months of this project are devoted towards developing this application, which will help REALM efficiently and effectively provide information to migrants and agents about the recruitment relationships they may be entering into. This project augments a unique study of migrants from Sudan to Saudi Arabia conducted in 2014 by expanding both its conceptual scope and the size of its sample. It draws on an administrative dataset from the Sudanese government to construct a sample of migrants to Saudi Arabia. This project will allow new insight into the challenges facing Sudanese labor migrants in host countries and the role of networks in the flow of Sudanese migration to other countries. More specifically, it seeks to uncover the consequences of new Saudi financial policies towards migrants and their dependents, both on migrants and their families and on economic and social conditions on Sudan. Recent changes in the Saudi economy serve as a natural experiment through which to examine how exogenous shocks to a host country’s economy reverberate through sending country communities. This pilot project designs and evaluates the impact of skills training and certification on recruitment of low-skilled labor migrants from a virtually untapped international migration corridor- North-Eastern India to the United Arab Emirate- focusing particularly on women. The researchers seek to understand whether the act of migrating and the capital that follows has the potential of altering migrants and their communities' welfare in terms of their economic behavior, policy preference, socio-political engagement, intra-household bargaining, and tolerance levels. They hypothesize that women will be more likely than men to invest the resources they accrue from labor migration into long-term development resources for their children, households, and local social communities. If resource access constrained women's prior political participation, we also expect to see greater political engagement as a result of women's labor migration relative to men's migration. This project seeks to create a scalable model for interventions that can be applied to an expanded sample size, in a larger geographical area.